Preceding his discussion of The Wealth of Nations (WN) in his Account of the Life and Writings of Adam Smith, LL.D, Dugald Stewart offers the following caveat lector: “Of a book which is now so universally known as ‘The Wealth of Nations,’ it might be considered perhaps as superfluous to give a particular analysis; and, at any rate, the limits of this essay make it impossible for me to attempt it at present. A few remarks, however, on the object and tendency of the work, may, I hope, be introduced without impropriety” (Stewart III.20). And, so too, will it be that this current, even briefer essay attempts only a few remarks on some of the primary themes of WN, with the same hope of avoiding impropriety. Without prejudice against the many compelling aspects of this magisterial work that will remain untouched, the topics to be discussed here will include the following: (i) An overview of Smith’s ordering of subjects in the five books of WN; (ii) The basic principles of political economy and human nature outlined in WN; (iii) The three main theories of political economy discussed in WN; & (iv) The role of the government in economic policy developed in WN. An illustration of pin-making from Diderot's Encyclopédie, 1762. (Wikimedia Commons) In Wealth of Nations, Smith uses pin-making to explain the division of labor. Although the extraordinarily vast breadth and scope of WN resists simple characterization, it is not inaccurate to distill its historical and analytical aim as Dugald Stewart does in the claim, “To direct the policy of nations with respect to one most important class of its laws, those which form its system of political economy, is the great aim of Mr Smith’s Inquiry” (Stewart IV.7). For all its subsequence importance in the history of economics, Smith saw WN as part of his larger systematic, ethical project of directing the design of institutions and practices in a manner appropriately coordinated with the principles of human nature, as he understood them. In this sense, the arguments and illustrations of WN intend to advise legislators and magistrates on the ways of structuring the civil institutions and policies that surround the practices of production and exchange so as to best encourage public opulence, and thereby public happiness. To Smith, this was a project of particular urgency, given that the progress of opulence in many nations was often unnecessarily inhibited by misguided political-economic policy. Towards this goal, WN is broken down into five separate books. Book I treats the principles of human nature, labor, and trade as they contribute to the improvement of more efficient and socially beneficial forms of production and distribution. Book II turns to the accumulation and employment of stock (or capital) in projects of production, trade, and the development of national wealth. Book III approaches the topic of political economy historically chronicling different national policies towards manufacturing, commerce, and industry since the fall of the Roman Empire. Book IV expands on these historical examinations with the aim of comparatively assessing the benefits and costs of different theories of political economy, primarily juxtaposing Smith’s preferred liberalist theory to the prevailing commercial or mercantilist theory. Finally, Book V applies the preceding analyses to the topics of government design, revenue, and expenditure. As is evident at the outset of WN, Smith was deeply taken by the great and increasing degree of opulence that characterized many modern and civilized nations, particularly those European. The first two books of WN are largely an effort of explaining the principles of economic activity and the principles of human nature that have contributed to this general condition of wealth. Central amongst the causes of this great improvement in the productive power of labor is the Division of Labor. First accomplished in rudimentary societies by the separation of productive tasks between different individuals, the division of labor achieves its most opulence-inducing effects in modern industrializing societies where particular productive tasks are distributed between persons. Smith’s famous example is that of the pin factory, in which “one man draws out the wire, another straights it, a third cuts it, a fourth points it, a fifth grinds it at the top for receiving the head,” and so on (WN I.i). As a result of such divided labor, these persons could fashion “upwards of forty-eight thousand pins a day,” whereas Smith speculates that one workman going it alone, lacking familiarity with the advanced machinery of the factory “could scarce, perhaps, with his utmost industry, make one pin in a day, and certainly could not make twenty” (ibid.). Importantly, Smith is not insensitive to the potentially devastating intellectual and social effects of confining individuals to the performance of such simple operations in their labor. A substantial argument of the fifth book’s discussion of government supported public education (one instance among several exhibiting Smith’s willingness—contrary to the neoliberal, laissez-faire misappropriations of Smith—to support public goods means of distribution and market-including interventions by the state) is aimed at correcting for the mental and moral “torpor” that may result from the industrial division of labor. Writing of these workers and of the need for government-supported education, Smith maintains, “His dexterity at his own particular trade seems, in this manner, to be acquired at the expence of his intellectual, social, and martial virtues. But in every improved and civilized society this is the state into which the labouring poor, that is, the great body of the people, must necessarily fall, unless government takes some pains to prevent it” (WN V.i.3). Underwriting the division of labor is a principle of human nature that Smith holds to be universal in all persons: “the propensity to truck, barter, and exchange” (WN I.ii). For Smith, this social and discursive disposition to engage and interact with others is rooted in our faculties of reason and speech. This disposition moves individuals to coordinate and cooperate with one another prior to and without any explicit agreement or contract. Only in developed societies is the propensity to truck, barter, and exchange given its full economic realization in the division of labor and the formation of markets. Markets of exchange and the extent of their size are essential to the value of divided labor. Without such markets for exchanging goods there would be no reason to produce commodities, such as pins, at the advanced rate of production accorded by the division of labor. One of Smith’s most enduring insights is the simple yet elegant explanation of the mutual dependence between the division of labor and the extent of markets (I.iii). In conjunction with this, the advent of money or currency is crucial to facilitating the exchange of goods, especially over vast distances (I.iv). By combining these basic principles of economy and human nature, Smith argues that nations can increase their wealth by rendering the labor of their producers more efficient, thus improving the real recompense of labor in exchange. In addition to the propensity to truck, barter, and exchange, Smith also claims that each human is naturally possessed of the desire “to better his condition” (WN II.iii). While the former discursive disposition is the psychological source of the division of labor, the disposition to better one’s condition is the psychological cause of the practices of saving and investing. Saving, in particular, is of primary import insofar as it leads producers to accumulate capital stocks over time, beyond merely recouping their initial investments, plus profit spent on consumption. Accumulated capital is essential to supporting and increasing the division of labor and productive improvement. There exists a feedback loop here, in which the advancement of productive efficiency and open exchange leads to greater opulence; this greater opulence leads to the accumulation of capital, which in turn promotes further advancements in productive efficiency. Two interrelated points about this process merit mention here. First, the aim of this progress of opulence is not that of increasing the wealth of the owners of capital (‘capitalists’ as we later have come to know them—the term is not used by Smith) at the expense of the rest of society. Smith’s conviction is that productive efficiency will increase the wealth of the nation as a whole and with respect to all of its classes, even that of the wage-laborer. The “liberal reward of labor” for all persons is the intended condition of prosperity in civilized nations (WN I.viii). Secondly, and relatedly, Smith is often mistakenly interpreted as underwriting this entire process with a self-interested or profit-based theory of human motivation. This exclusively homo economicus interpretation of Smith’s theory of human nature could not be further from his views, and those who misinterpret Smith along these lines have been prone to decontextualize and over-generalize the famous lines in which Smith remarks, “But man has almost constant occasion for the help of his brethren, and it is in vain for him to expect it from their benevolence only. He will be more likely to prevail if he can interest their self-love in his favour, and shew them that it is for their own advantage to do for him what he requires of them…It is not from the benevolence of the butcher, the brewer, or the baker, that we expect our dinner, but from their regard to their own interest. We address ourselves not to their humanity but to their self-love, and never talk to them of our own necessities but of their advantages” (I.ii). Read in their appropriate context, these remarks are exclusively limited to the discussion of the appropriate motivations of one particular type of economic exchange—buying and selling. They are not to be taken as an expression of human motivation generally, and Smith’s writings are replete with discussions of many other-regarding forms of motivation and sentiment. If anything, the desire for respect, recognition, and mutual sympathy—not self-love—is the deepest of Smithian drives. Following the historical discussions of political-economic policies and institutions in the third book of WN, Smith turns in his fourth book to a comparative analysis of three distinct theoretical Systems of Political Economy: (i) The Commercial or Mercantile System, (ii) The Agricultural System, and (iii) Smith’s favored Simple System of Natural Liberty. Regarding the second of these, Smith had become acquainted with the Agricultural System through his interactions with the French Physiocrats during his travels in France. Although he claims in WN that this system is “the nearest approximation to the truth that has yet been published upon the subject of political economy,” Smith still found it flawed for its overvaluation of agriculture and land development, and he discusses it only cursorily insofar as it “has never been adopted by any nation, and it at present exists only in the speculations of a few men of great learning and ingenuity in France…and probably never will do any harm in any part of the world” despite its errors (WN IV.ix). With the governing interest of correcting for the real, practical, ethical harms of misguided political-economic policy, Smith devotes his primary attention in Book IV to exhibiting the opulence-impeding flaws of the Mercantile System, the then prevalent theory of political economy in Europe. The first mistaken tenet of Mercantilism is the overvaluation of money, or the belief that the wealth of a nation is a function of how much gold or silver it possesses. Smith argues that doctrine involves a sophistical fetishizing of money, whereas the true wealth of a nation consists in real value and purchasing power of its labor as determined by its productive and commercial practices and institutions (WN IV.i). Related to this mistake is the mercantilist doctrine of the balance of trade. In order to increase a nation’s store of gold and silver, mercantilist states attempt to severely regulate their import and export practices so as to dis-incentivize currency flight. Smith believed this balance of trade policy to be a product of the “interested sophistry of merchants and manufacturers,” and he argued that it had very little effect on national wealth, while at the same time it encouraged animosity and mutually detrimental, nationalist bias between nations. A third flaw of Mercantilism, dependent on first two, was the project of imperialism and colonialism. Smith was particularly acerbic in his critique of colonial imperialism both for the economic irrationality involved in establishing “a great empire…for the sole purpose of raising up a nation of customers” and for the unjust oppressiveness that such empires delivered upon the “harmless natives” of colonized territories” (IV.vii-viii). 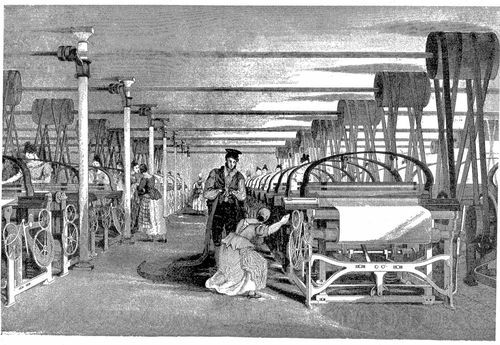 Illustration of industrial power loom by T. Allom, 1835. (Wikimedia Commons) Smith’s preferred political economic system of Natural Liberty is largely defined in contrast to the Mercantilist model. Avoiding the fetishization of gold and silver, lifting barriers to exchange, promoting anti-monopolistic and anti-apprenticeship legislation, and refusing to engaging in the project of empire would lead, according to Smith, to a political economy that would be free to fully realize the opulence-inducing productive processes outlined at the outset of WN. Mechanisms for exchange within and between nations should be left largely open so as to encourage production in ways that foster comparative advantage and the development of economies of scale. Within this system, the sovereign would be “completely discharged” of any role in “superintending the industry of private people” (WN IV.ii/ix). However, this is not to say that the sovereign would no longer have important roles in legislating and executing laws that aim to correct for market externalities as well as determine the distribution of various public goods, in market-including ways. Notably, it is during Smith’s articulation of his System of Natural Liberty that one finds his infamous image of the Invisible Hand. Although many neoliberal economists have appropriated this figure to support their belief in self-regulating market mechanisms, and, in particular, that the pursuit of individual profit when structured through free markets will promote the common good, Smith’s own application of the Invisible Hand metaphor in WN is more appropriately understood as illustrating the tendency of unintended consequences to arise from intentions aimed a distinct, explicit ends, whether or not these ends be self-interested (WN IV.ii). Smith was astutely aware of the limitations of free markets due to a variety of externalities, and using his Invisible Hand metaphor as the symbol of laissez-faireism is not supported by Smith’s writings. In the closing Book V of WN, Smith reflects on the appropriate activities of sovereignty as well as how to finance these activities. In Smith’s preferred political economic system of Natural Liberty, the sovereign has three broad categories of duty: (i) “to protect the society from violence and invasion,” (ii) to protect “as far as possible, every member of society from the injustice or oppression of every other member of it, or the duty of establishing an exact administration of justice,” and (iii) to erect and maintain “those public institutions and those public works, which, though they may be in the highest degree advantageous to a great society, are, however, of such a nature, that the profit could never repay the expence” of any persons who might support it privately (WN V.i.1-3). While many of these aspects of public finance are directly market protecting or facilitating, it is clear that the latter two duties of sovereignty open ample space for the possibility non-market-based distributions. For instance, with respect to the duty of justice, Smith treated poverty as a basic deprivation of freedom, which needed to be protected against by the administration of justice (similar considerations apply to his support of public education, mentioned above). More generally, one finds Smith to have been as intensely concerned to diagnose the imperfections of markets as he was to expose the many unfortunate follies of restricting their proper function in helping humanity to establish a cooperative venture for mutual advantage. Dugald Stewart, Account of the Life and Writings of Adam Smith, LL.D.